Losing a lover is a heart ripped off, losing a brother is a soul taken away. June 13 1982 was the scissors which broke Nii Lartey Tsuru III from his umbilical cord. He was raised on the beaches of James Town where fishing was the oldest trade in the family and indulged every healthy looking male child. The two brothers grew up like climbing plants, entangled in each other’s affairs. They would leave for sea early in the morning and return with their shoal at night. 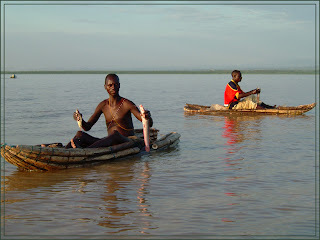 But in the rainy seasons, they left around 6am and returned the following morning with a bountiful catch. The women in the community are solely responsible for marketing the fish. Tuesdays are traditional off days for all the fisher folks. They usually stay at home and mend their nets or service their outboard motors. I perched with half-buttocks on a bamboo bench at the shores of the sea, eating my snack and sipping on a bottle of club soda. After a few minutes, I heard a voice saying “Anyɛmi ha ma gbabo sane ko”. He introduced himself as Lartey Tsulu III and started his story. He and Tetey Yen always went fishing together but on that sunny Thursday afternoon, he went to queue for premix fuel so they would have enough for the coming days. When the ‘Lɛ lɛ kɛ yaa’ was afloat, Tetey waved at him and shouted “tsɔne lɛ mli ye ni kpakpa, wɔ baa na loo waa”. Early the next morning Lartey carried a gallon of premix and set out to meet his brother. All the boats had returned with the exception of the Amugi’s and theirs. After 5mins, he saw Amugi’s boat approaching the dock but theirs was nowhere to be found. “Ngbɛ wɔ yaa yɔɔ,” he questioned Amugi. Ngbɛ Tetey wɔɔ …. The news sank his spirits. “Your boat capsized and Tetey drowned in the process”, Amugi narrated. “The boat sunk and his body could not be recovered.” Tetey who had won fastest swimmer at the annual James Town Homowo swimming contest got drown at sea? Amugi you must be joking, Lartey fumed. “Produce my brother now now oo me I’ve told you.” It took several hours to come to terms with the obvious reality that Tetey Yen II was no more. Later that night after enough wailing, Lartey decided to take solace in the bottle. He moved to the blue kiosk near by and drunk his head off. Mostly, he drank his tears in place of the hot Apkɛtɛshi gin he was clasping. Lartey found himself floating on the sea clinching on to his green bottle. Out of the blue he had a voice “Lartey Tsuru III do you want to join me here or do you want to know what really got me killed” It was Tetey dressed in a white suit –something which was very usual of him because he never liked the color white- . “Come, let me take you to where it all started,” Tetey said. As though in a trance, Lartey felt a sharp pain in the head and before he knew it, he and his brother were standing in their boat. Tetey put out his lantern and started pulling his net into the boat. His net had caught a lot of fish, and was bursting at the seams due to the weight. Then they both heard a loud cry “Tetey jump, the ship will kill you…” before Tetey could heed the call, his boat was destroyed by a foreign ship. His body was drawn by the current from the super powered motor of the ship and was instantly sliced into two. In a split second, Lartey saw himself standing with his brother. “This is what actually happened, this is what killed me…The white man’s ship.” Lartey went blank, coming back into his body to realize he was lying on the floor in a bar, holding on to his green bottle. “So that is what happened to my brother… tell those politicians to stop drinking the FONKAR beer while they smoke the ‘all die be die’ weed” . “I lost a brother…. Another lost a father…another lost a son… some other lost a grandfather. I thought they said Pair trawling was a thing of the past?